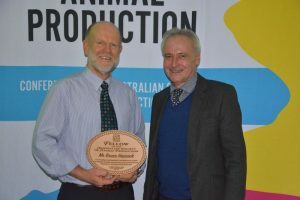 In July 2018, long time BIGG supporter and mentor, Bruce Hancock (Senior Livestock Consultant, PIRSA-Rural Solutions SA) was bestowed as a Fellow of the Australian Society of Animal Production. Bruce received this prestigious award at the society’s biennial conference in Wagga Wagga, for his tireless commitment to developing the livestock industry and mentoring the next generation. Bruce received the award from ASAP President, Phil Hynd. Further detail about the award, including Bruce’s achievements can be found in an article that appeared in the Leader on July 11, 2018. Bruce is a long standing member of the Angaston Ag Bureau and was instrumental in getting BIGG ‘off the ground’ in 2012 and our successes ever since. The highly valued Ag Ex Alliance Grower Group Award, sponsored by Primary Industries and Regions SA (PIRSA), went to Barossa Improved Grazing Group (BIGG) for putting forward an educational proposal to benefit their members, the local and broader agricultural communities. BIGG will put the $5,000 towards two ‘soil health’ webinars and attendance of 25 members at a ‘soil health’ field day to be held by Fleurieu Forward Farming. Chair Graham Keynes accepted the award from PIRSA Chief Executive, Scott Ashby on behalf of BIGG. Graeme acknowledged Brett Nietschke as the driver behind the project as well as being a significant contributor to BIGG. “Healthy soils are fundamental to the sustainability of farming systems. They store and cycle water and nutrients effectively and provide optimal conditions for plant growth and health”, said Graham. Scott Ashby congratulated the BIGG group on their quest to up-skill local producers in soil health practice and praised their collaborative approach to supporting and working with fellow grower groups. The Landcare Association of SA Conference and Awards Dinner in Clare last week was a fruitful occasion for Barossa farmers and Landcarers. The Barossa Improved Grazing Group was one of the lucky winners at Tuesday night’s awards presentation, held at Clare Golf Club. 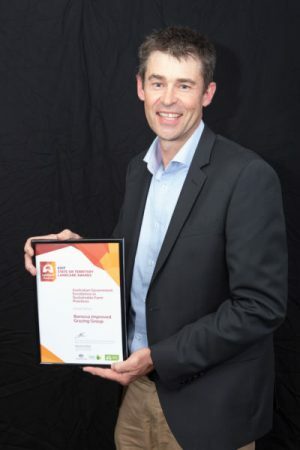 BIGG picked up the gong in the Australian Government Excellence in Sustainable Farm Practices Award after being selected as one of three finalists. In its five-year history, BIGG has engaged with over 400 producers from beef, sheep and dairy industrues, and delivered 17 projects in collaboration with stakeholders. It has implemented on-farm integrated land management practices across 50,000ha of grazing land, with a total of 60,000 head of livestock, in the Barossa Valley and Eastern Mount Lofty Ranges. BIGG facilitator Brett Nietschke was on hand to accept the award. Barossa Grape and Wine Association was a finalist in the Premier’s NRM Excellence Award. BIGG wins state landcare award! 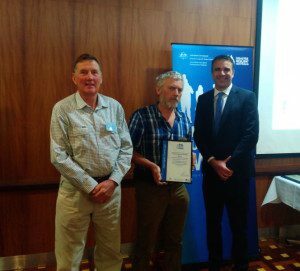 The State Landcare Awards were held in Clare on 12th September 2017 where BIGG won the Australian Government Excellence in Sustainable Farm Practices Award. The award recognises an ‘individual, group or organisation that has demonstrated excellence and leadership in implementing integrated land management practices to a farm property or properties that protect soils, water and vegetation’. The award is also strong recognition for Angaston Ag Bureau, who has operational and monitoring oversight of BIGG’s projects. Since BIGG’s inception in 2012, support from the local NRM boards (Adelaide and Mt Lofty Ranges, SA MurrayDarling Basin) has also helped ensure BIGG delivers innovate projects that respond to the needs of local producers. 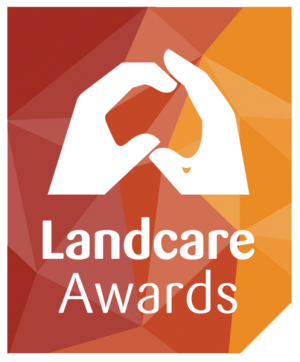 BIGG will now represent SA in the Sustainable Farm Practices category at the 2018 National Landcare Awards. Well done team BIGG! In January 2017, Keyneton farmer James Graetz was awarded the SA citizen of the year in a ceremony at Government house in Adelaide. He also received the Mid- Murray council citizen award. James is a long time member of the Angaston Bureau, including recently serving as chairperson. Mr James Graetz, Keyneton farmer, has been named South Australian Citizen of the Year. James will be presented with his state award from the Australia Day Council on January 23 at the grounds of the Government House in Adelaide. James was also awarded the Mid Murray Council Citizen Award. He was nominated for the awards due to his ongoing commitment to not only his local Keyneton community but also all surrounding communities in the district. After receiving the phone call to be told he was the South Australian winner for 2017 James was excited but humble. 30 years as the captain. During the 2014 Eden Valley fires James was commended for his fast action and for the considerable amount of energy he put into rebuilding and helping the community move forward. The community members admired James for these efforts, especially as his farm was severely impacted in the Eden Valley fire. He was involved in the volunteer-based organisation BlazeAid during this time and also for the Pinery Fire of 2015. With James’ vast experience and knowledge, he now gives talks to a variety of community groups through BlazeAid. James said he receives huge support from his family and from the community which makes what he does easier. James’ wife Carol sadly passed away 12 years ago. However he still has the constant support of his two children Kym and Sally. Among his life long achievements with the CFS James has also contributed to many other community organisations. Coming from a farming background, James has been a member of the Angaston Agriculture Bureau for the past 36 years and during his time there has served terms as both the president and vice president. James has also been heavily involved in youth groups within the community as well as religious organisations and schooling committees. In December 2016 BIGG/Angaston Ag Bureau received a Highly Commended Award for our Eden Valley bushfire recovery and resilience program. The program assisted producers to optimise the re-building of native pasture and livestock in the wake of the fire. The State Resilient Australia Awards recognise initiatives that improve community safety and resilience, and empower individuals, communities and organisations in the preparation, recovery and response to emergency events. 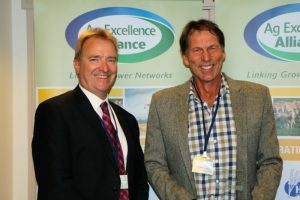 In 2014 BIGG was awarded the Ag Excellence Alliance Sustainability Award by its peers (sponsored by the Department of Environment, Water and Natural Resources) as ‘an outstanding locally based grower group for its achievements in delivering greater NRM outcomes’. We received $2,000 for the award which we used to help develop our current strategic plan. 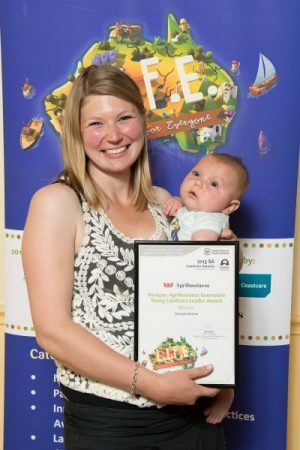 BIGG Technical Facilitator, Georgie Keynes was successful in winning the 2013 South Australian Westpac Agribusiness Innovative Landcare Leader Award, and was subsequently a finalist in the National Landcare Awards in 2014. Georgie was recognised for her passion for sustainable land management, technical and leadership skills, on-farm experience, and personal commitment. 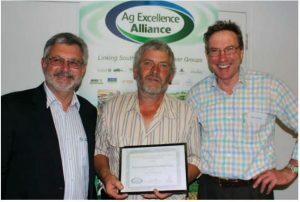 BIGG’s parent group, the Angaston Agricultural Bureau, received an Encouragement Award at the 2012 Ag Excellence Alliance Forum for its various activities, including a farming resource forum attracting over 70 attendees, which focussed on sustainable cropping and grazing systems.